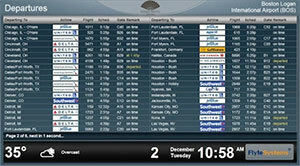 Scott Triphahn, Flyte Systems vice president said, “FlyteChannel is a valuable amenity for hotel guests, particularly during high-volume travel seasons. 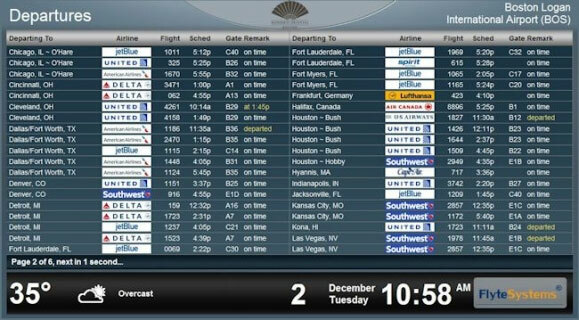 FlyteChannel displays cities, flight numbers, scheduled and actual arrival/departure times, airline logos, and gates in the same familiar format used by airports.” FlyteChannel is compatible with all major in-room TV technologies. Flyte Systems works with the property’s in-room provider to get FlyteChannel up-and-running – quickly and smoothly. An intimate, luxurious hotel, Mandarin Oriental, Boston combines classic New England elegance with refined Oriental touches to create one of the most distinctive hospitality experiences. Awarded both Forbes Five-Stars and AAA Five-Diamonds, Mandarin Oriental, Boston features 148 guestrooms and suites, delighting guests with the finest facilities and service, innovative dining experiences, and an unparalleled holistic Five-Star awarded spa. A short, 15-minute drive to Logan International Airport, Mandarin Oriental, Boston connects guests to the city’s finest shopping, cultural venues and business institutions from its prime location in the heart of chic Back Bay on Boylston Street.